Come visit us on the following dates to see what's blooming in our gardens. We've scheduled days throughout our bloom season so you can experience the variety and sequence of iris bloom. We will be open each of these days from 10:00 am until 4:00pm. If these days don't fit your schedule, please contact Patrick to schedule a private visit. 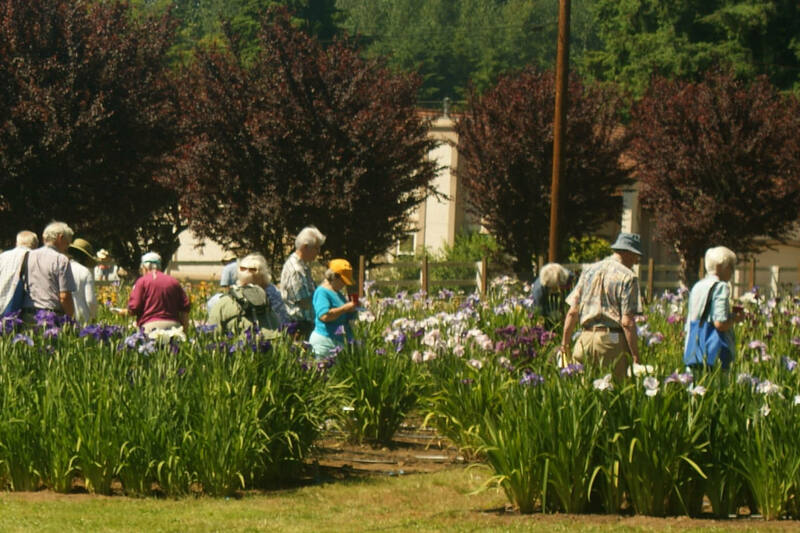 Take a tour through the Cascadia Iris Gardens beautiful display beds and production rows to learn about the vast variety of irises we can grow in the Puget Sound. Hear about the cultural needs of each type of iris and how to grow them successfully in your garden. Click here to open the Iris 101 - The World of Irises reservation form. Print it out, fill in the bottom portion and return it to us with your payment to reserve your spot. Learn when and how to properly care for your beardless irises. The classes will have lecture time and "hands on" opportunities. Class size will be limited. Please register early to ensure you are not left out. Classes will be held Rain or Shine. Click here to download the Iris 101 - Culture reservation form. Print it out, fill in the bottom portion and return it to us with your payment to reserve your spot. Everything you need to know about hybridizing irises. Learn the ins, outs and secrets of hybridizing irises. We will cover a bit about genetics, some hybridizing strategies, and the physical steps needed to successfully hybridize an iris. Click here to download the Iris 101 - Hybridizing reservation form. Print it out, fill in the bottom portion and return it to us with your payment to reserve your spot. We have pulled together growing instructions for many of the irises we grow. Please select from the list below. Most are specific to our Puget Sound area of Washington State. For specific directions local to your area, or if you do not find what you are looking for, feel free to email Patrick. He is happy to help you grow these successfully. Iris - A Flower For All Seasons! 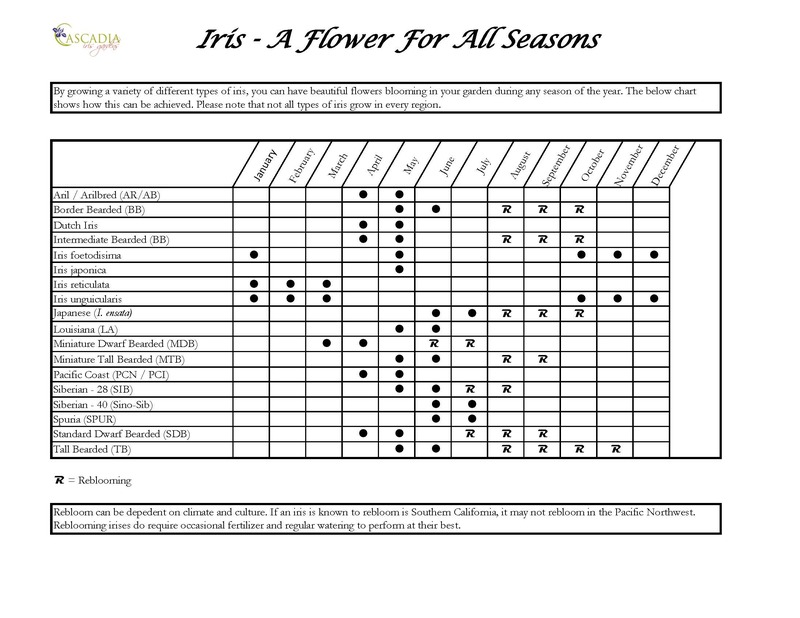 Click on this link to see a chart that shows how, by growing different types of iris, you can have irises blooming in your garden nearly year 'round. Please note that your results may vary, depending on your local climate, soil type, etc.